The day after Black Friday is always bittersweet. Not because of those who are trampled to death by throngs of rabid shoppers (there's no need to grieve - those who fall on Black Friday will rise again in Valhalla's Megamart, the greatest of all fates), but because we know we'll have to wait an entire year before the next. 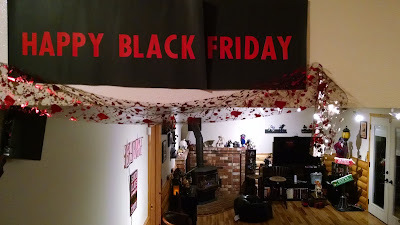 As you've probably guessed, these photos are from our semi-annual Black Friday Party, where we offer friends a place to rest before they head out for a final round of shopping (we assume). 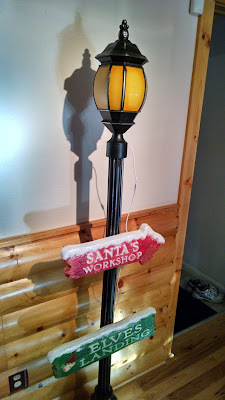 We gathered together, shared some laughs, and reflected on the true meaning of the holiday. Turns it it's consumerism. If you had consumerism on your scorecard, congratulations - you're a winner. But as much as we'd love to hold onto this moment, Black Friday also serves as a reminder: there's only 395 shopping days until Christmas 2018 (I'm assuming everyone's already prepared for this Christmas - otherwise you're in serious trouble). Why Him? is a raunchy farcical version of a story the movie industry loves to tell over and over: father disapproves of daughter's boyfriend, shenanigans ensue. 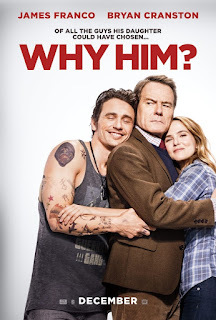 In this case, the father is played by Bryan Cranston, and he's the owner of a now-struggling printing business, while the boyfriend, played by James Franco, is an eccentric self-made app-store mogul. The daughter (Zoey Deutch) gets her family to visit her and the boyfriend in California for Christmas, and awkwardness follows. Franco's character swears unstoppably and is emotionally needy, relentlessly sexual, and socially clueless. Once the father finds out that the boyfriend intends to propose and the daughter is contemplating dropping out of school to run a nonprofit the boyfriend will supposedly fund, he goes into a progressive freakout where his attempts to undermine and find evidence against the younger man provoke an all-out breakdown. While keeping Christmas in our hearts all year round may be too ambitious a goal for even us, we find that doing the bulk of our holiday shopping in the weeks after Christmas can extend that yuletide feeling well into January. Also, it saves us a ton of cash, largely thanks to the fact that stores unload any remaining junk at steep discounts once the 25th has come and gone. The decorative piece I'm looking at today is no exception. This was originally priced at $69.99, though I'm not sure I ever saw it selling for less than half that. As soon as last year's seasonal merchandise was on the shelves, it was joined by a 50% sign that never seemed to disappear. For all intents and purposes, retail on this thing was thirty-five bucks, which is probably good, because there's no way in noel this is worth seventy. I wanted to hate this. I'm getting that out of the way first, so you have some idea of where I'm coming from. On principle, I dislike this series, not so much for its content but for what it represents. 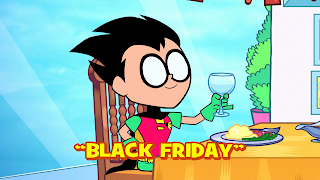 I liked the original Teen Titans, as well as Young Justice - the last thing I wanted was a hokey show that reduced the characters and premise to cheap jokes. So I set out to hate this. But then... then something went wrong. Horribly, horribly wrong. This episode elbowed me in the gut, kicked me in the shin, then reached in through my cold chest and violently wrenched my heart away from me. It made me love it, whether I wanted to or not. That's also a fairly good synopsis of the premise. But with this new special there's no room for disagreement or confusion. It's Christmas in Arendelle. 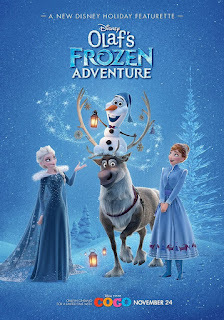 The premise is that it's the first holiday season since the events of the movie, and so it's the first opportunity that royal sisters Anna and Elsa have for a holiday celebration both in public and together. They decide to throw a party, but after a public ceremony, the local folks all have their family traditions to get back to. The sisters realize that their lives have been so circumscribed by hiding Elsa's powers that they don't really have any traditions of their own. Olaf sets out to save the day by collecting traditions from the townspeople. Naturally, complications ensue. 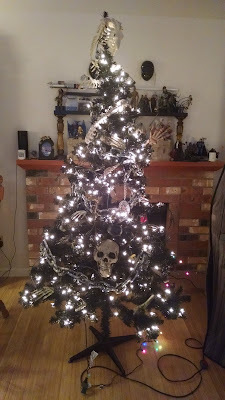 Black Friday tree, Black Friday tree Your advent's been foretold Black Friday tree, Black Friday tree Cast in an industrial mold. Over the years, I've found the large drug store chains to be abundant sources of bizarre holiday decor, none more so than Rite Aid. Their seasonal section seems to be full of a wide array of Christmas oddities that linger well into January, when everything becomes more affordable. That's the story behind this, of course. I grabbed it last year when it hit 70% or 75% off. As you can probably tell from the image, these are low-end animatronic birds fixed to a stand decorated with fake tree pieces. 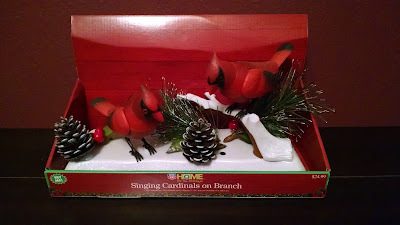 When activated, they erupt in a chirping version of "We Wish You a Merry Christmas" at deafening volumes while LED's light up behind them. This is the part of the review I typically go into a rant about the crappy quality, or stupid concept. But there's a problem... I kind of love this thing. 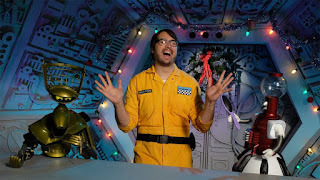 If you haven't tried the new episodes of MST3K, available on Netflix, you should. They are a lot of fun, they keep what worked about the original formula while adding new twists, and you'll know what I'm talking about when I say that one of my life goals is now to have as much fun as Felicia Day is having every second she's on screen. The cast features a who's who of the geek-culture parts of the internet, with Day and Patton Oswalt as the recurring villains and brief guest appearances including folks like Neil Patrick Harris, Mark Hamill, and Wil Wheaton. I've watched 12 episodes and I'm still amused by the inclusion of commercial bumpers as if the show were made to have commercial breaks. These episodes have more ongoing plot in the scenes that break up the movies than I remember from the original show, but I probably never saw more than one episode in a row before. This episode in particular is building toward the season finale. It starts in March, but it's quiet - so quiet you can only hear it when the wind dies down and you're perfectly still. You don't even notice it until you're trying to fall asleep. A shuffling sound, at most - you can ignore it most nights. Pretend it's not even there. Most of the time it doesn't even cost you sleep. Most of the time. By June, though, it's grown into an audible scratch. Sometimes you climb into the attic, thinking there must be some injured animal up there. But there's nothing. Nothing but the boxes. And you dare not even look at those, not in the summer. In September, it's tapping. Knocking. It wants you to notice. It wants you to let it free. But it's still fall, so you try to ignore it. But now... now it's pounding against the ceiling. Rhythmic, ceaseless. It won't be ignored.